TEL AVIV – Hamas is in the process of building a sophisticated network of tunnels beneath​ the Gaza Strip, according to multiple sources with knowledge of the ​issue speaking to Breitbart Jerusalem. The tunnel infrastructure mirrors ​the network built by Hezbollah in Lebanon. The Iran-sponsored militia is known to have ​dug a vast underground tunnel ​complex replete with war rooms, internal communication lines, ventilation systems, and even missile silos. Israel ​destroyed​ a significant portion of Hamas’ previous tunnel system during Operation Protective Edge in the summer of 2014. One source, a member of Hamas’ ​”​military wing,” ​​told Breitbart Jerusalem that following the operation, Hamas enlisted hundreds of ​terrorists ​in order to construct an even larger tunnel network. 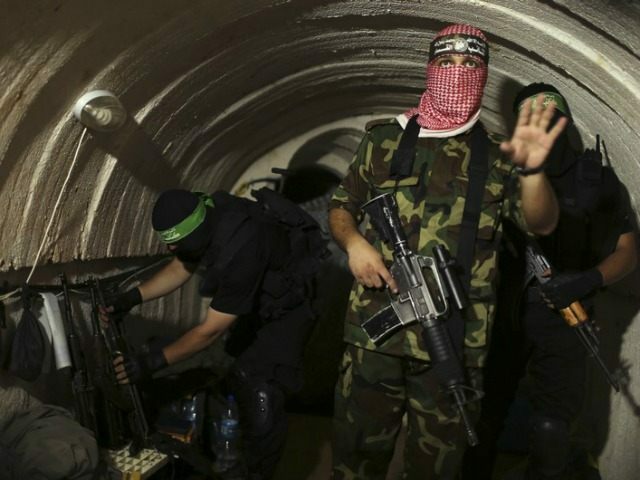 The Hamas source claimed ​that the terrorist group has succeeded in restoring much of its former tunnel system. He said the next stage involves linking tunnels in north Gaza with those under Gaza City and the south. The source conceded ​that this​ requires at least two more years of work. While Hamas’ ​claims ​could not be immediately corroborated, Jordanian and Israeli security sources said there is​evidence that Hamas is working tirelessly to build a new networks of tunnels. “The IDF is aware of the fact that Hamas has been working to rebuild its sophisticated tunnel network within the Gaza Strip. Abu Khaled, a spokesperson for Hamas’ so-called military wing, had no comment on the Breitbart Jerusalem report. Last week, ​the former​ head of ​IDF Southern Command Maj. Gen. Sami Turgeman told a panel at Sapir College in Sderot -​ located less than a mile from the Gaza border -​ that Hamas is working hard to rebuild its tunnel system. ​ ​In July, IDF Col. Nochi Mandel, the deputy commander of the Gaza Division, told Israel Radio that Hamas was hard at work rehabilitating its military infrastructure.